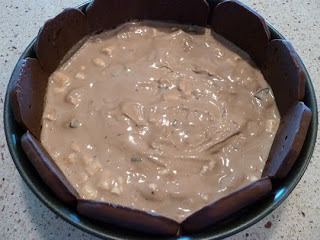 Inspiring Ideas with artist Jeanne Winters: "Messy Boy Party" Part 3: Ice Cream Cake! "Messy Boy Party" Part 3: Ice Cream Cake! If you've followed my previous two posts, you knew what was coming. 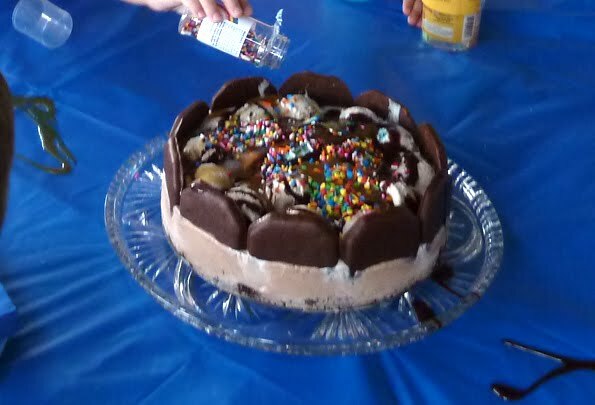 The "cake" portion of the Messy Boy Party that I threw for my son's 4th birthday. That was part of the entertainment! 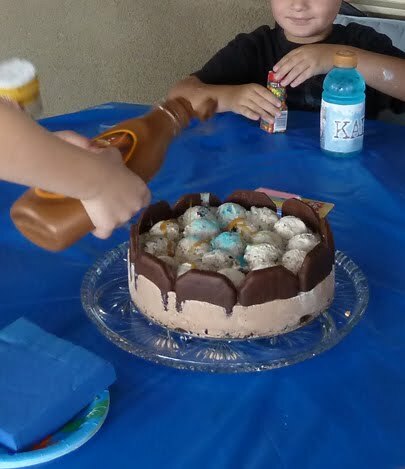 Each little guy picked something from the topping bar and they took turns decorating the birthday cake! They chose blue sugar, lots of assorted sprinkles and some generous dumpings of chocolate and caramel sauces... most of which landed on the table cloth! 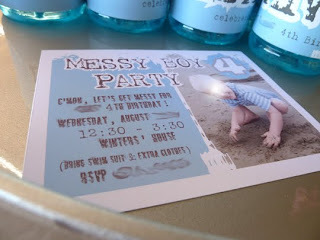 But they did love participating and, after all, this was a "Messy Boy Party!" 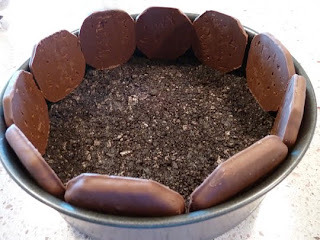 Crust of 25 crushed Oreo cookies with 1/4 cup melted butter. I used low-fat Oreos but not sure of the logic in that. :-) Pressed into bottom of my 9 inch springform pan. 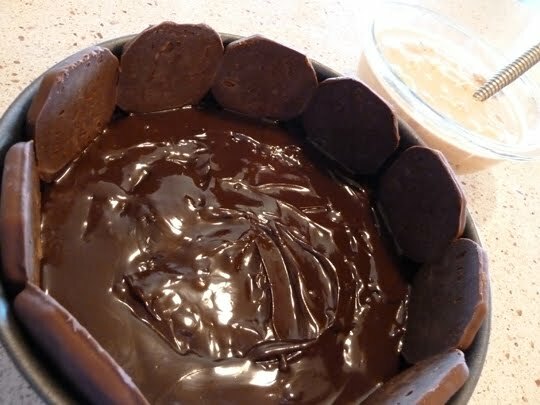 Standing around the rim are 10 chocolate covered graham cracker/cookies. Ours tasted VERY sweet, so slice thin! 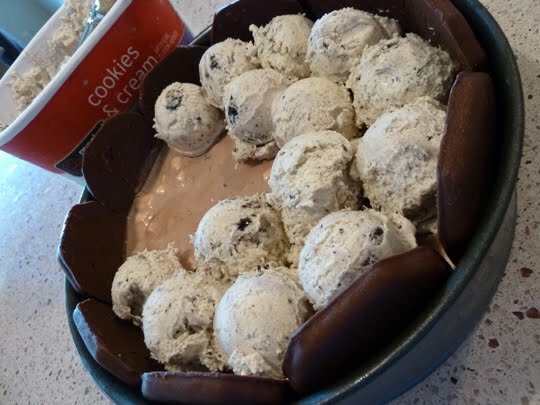 With those tall grahams, next time I'll double the ice cream quantities, too! 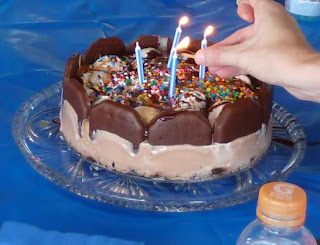 Hmmm, do I need another occasion to make my second Ice Cream Cake???? How about 'Just Finished First Week of School Occasion?!" 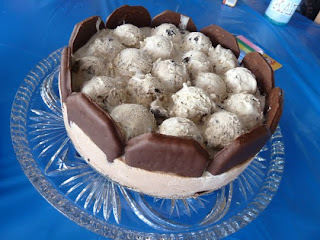 I love ice cream cake...I'm going to have to make that some time! 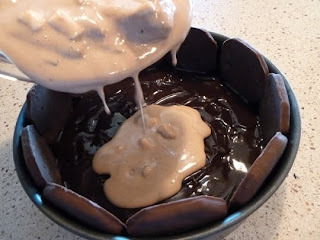 So much cheaper than store-made ice cream cake and more fun! I don't usually leave feedback on web pages but I wanted to take the time to thank you for sharing your ice cream cake recipe. My Daughter just gradutated from public School and as a treat I wanted to try something new. I had the idea weeks ahead that I wanted to make a home made ice cream cake. Having an "idea" as a baker is always bound to happen, But finding the right recipe is always a challenge... After watching endless youtube videos and reading many blogs, I came across your recipe and it appealed to me the most. I've never made an ice cream cake but I think I could tackle one after reading this. Well done. That is SOOOO cute! Such a wonderful idea! I think a messy boy party is brilliant. Having had several messy boys in my life, they probably would have loved this. Maybe I'll use this idea for my grandsons now. 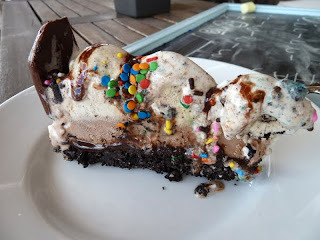 My mouth is watering because I love chocolate & ice cream! It looks so easy to make too. Yum!! I love ice cream cake! !